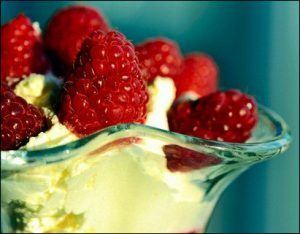 Enjoy these sweet recipes to cool you off and keep your skin healthy without sugar. According to cookbook author and nutritionist Robyn Webb, too much sugar can make skin dull and wrinkled, which is why she recommends replacing your usual sweeteners with all natural and no-calorie Stevia. Cut down on your sugar intake and turn back the clock with these two recipes from Webb. If you make this recipe with stevia and sugar instead of just sugar, you save 35 calories which equates to 10 grams of sugar and 9 grams of carbohydrates. 1. In a food processor, process the ricotta, stevia and sugar until smooth. Transfer to a bowl and mix in the Greek yogurt. 2. Spoon one third of the yogurt mixture into 4 tall parfait or dessert glasses. Divide half the fruit among the glasses on top of the yogurt mixture. Spoon another third of the yogurt mixture on top of the fruit. Add another layer of fruit and spoon the remaining yogurt on top of each glass. Sprinkle with slivered almonds. 1. Prepare the fruit mixture: Puree the strawberries, lemon juice, stevia and pinch of salt in a food processor or blender until smooth. Pour it into a container, refrigerate until needed. 2. Bring the 2 1/4 cups of cold water to a gentle boil in a medium saucepot. Add the tea bags, let the tea bag strings fall outside the pot for easy removal. Cover the pot, turn off the heat and let the bags steep for 15 minutes. 3. Add the sugar and 2 Tbsp stevia to a large covered container that will fit in the refrigerator. Remove the tea bags from the water. Do not squeeze the tea bags as this give the final tea a bitter taste. Discard the tea bags. Add the tea to the sugar-stevia mixture. Add in the 6 cups cold water, stir well. Set the container of tea in the refrigerator to completely chill. 4. When ready to serve, mix in the strawberry puree. 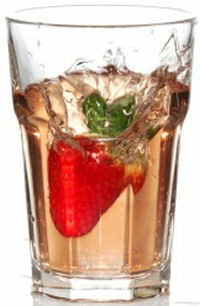 Serve each glass with a whole strawberry for garnish.